When it comes to bicycle computers, there are a lot of options. There are many products from many companies. Up for review is a premium quality product from Sigma, the Sigma BC2209 STS Targa. It is a more expensive product when it comes to bicycle computers, so you won't find it in your local Walmart. But as is the case with a lot of electronics, you tend to get what you pay for. I was very impressed with the product. It came well packaged, and was well protected in the packaging. It's quality and fit and finish was very good. And the included installation instructions were easy to follow. As you can see from the features and specs, the Sigma BC2209 Targa STS is not limited when it comes to accessories. It is loaded with features and comes with the accessories for these features. Your typical bicycle computer will come with the computer and the needed mounts. But the Sigma BC2209 will also work for hiking and personal training. So naturally, there are accessories for these features. Included in the box was a wristband with a mount built-in, so you can wear it when you go hiking or running. There is a sensor that you wear around your chest to read your heart rate. With this you can check your heart rate and calories burned. And an optional accessory for the Sigma BC2209 is the cadence sensor. With the cadence sensor, you can slow or increase the speed and track your cadence for personal training. Sigma even has a software program that will allow you to track your performance! Installation of the Sigma BC2209 Targa STS was easy to follow with the included instructions. And as the Sigma BC2209 can track use on multiple bikes, it also includes the accessories to do so. You can use the plastic ties to permanently mount it, or you can use the rubber bands to mount is. This mounting option allows you to easily move the sigma from bike to bike. Using the Sigma BC2209 was simple, and it performed very well. The display is large and sufficiently bright. The backlight is sufficiently bright at night. I also liked the 2 different modes, depending on functionality you want displayed. Setting up the device and going into the settings was easy to do. And the altimeter really did work! Taking it off road onto the trail caused no problems for the Sigma BC2209. I also loved the cadence accessory when doing my workouts and training. I was very pleased with the quality and performance of the Sigma BC2209 STS. If you have a mountain bike, and actually use it on the trail as it was designed, I would definitely suggest the Sigma BC2209 Targa. And for training, the cadence accessory is a worthwhile purchase. And being able to see your performance on your PC is just awesome! Based on it's design, features, and performance, the Sigma BC2209 has earned our Editor's Choice Award. For more info and complete specs, check out their website at www.sigmasport.com. Mp3 Players come in many different sizes. Up for review today is the Sansa Clip Zip, which employs a small and simple design. It is simple enough for use by all ages. And even though it is very simple to use, they managed to get a lot of features into a very small drive. The Sansa Zip Clip came well packaged and protected. It was placed in a molded plastic enclosure with a clear plastic cover. That way you can see the device through the box. Included items were the player, a small charging cable, earbuds, user manual, and installation software. The quality of the player seemed good. There was a spring loaded belt clip that appeared sturdy enough. The buttons felt good, and I liked the color LCD display. Fit and finish also appeared good. While a pair of earbuds were provided which is expected, they are also cheap in quality, again as expected. So you would probably want to use them just until you can replace them with a better fitting and sounding pair of earbuds. Using the device was simple, with different modes for music, audio books, radio, and recordings. Music is for just that. And you are able to look up your music based on album, artist, and genre. It also has a handy mix feature which will do a random shuffle and play songs on your device. You can also do a continuous loop and keep repeating a particular song. Audio books lets you save audio books on your device that you can listen to. The radio section allows you to scroll through the various radio channels in your area, and uses the cable in your earbuds as the antenna. You can also store your favorite stations in memory. It's recording feature allows you to record memos to yourself using the built-in microphone. It also gives you the ability to search through your recordings. Another really cool feature that I liked, unlike an iPod, is the available memory in the device. Thanks to the build-in card reader, the Sansa Clip Zip has unlimited storage. All you need is additional memory cards. The card reader also includes Sansa's Slot Radio functionality. This makes it compatible with Sansa's prerecorded music cards. These cards come preloaded with over a thousand songs from various genres. There are many different genres, such as 80's & 90's, Classical, Country, Rock, R&B, Oldies, etc. To test this functionality, Sansa also included a VH1 Classic card. This featured Billboard's top hits from the 70's, 80's, and 90's. I loved the 80's and One Hit Wonder categories on the card. Using the device proved to be very simple. It was easy to navigate trough the menus. I also liked the set-up feature that included an equalizer, so you can better customize the sound towards your liking. Sound quality from the device was also good. The built-in microphone performed as good as expected. It wasn't great, but it was usable. The sound quality was also good for the music section. It was not audiophile quality, but it was sufficiently good. Performance of the tuner was also as good to be expected from a sm all device. Local stations were pulled in ok. And downloading music was as simple as dragging music to your player thru Windows Media Player. I enjoyed using the Sansa Clip Zip. It was so simple to use, it really is designed for use by all ages. My eight year old was able to figure it out. And if this is a gift to help get grandma in the digital age, I'm sure she could figure it out as well. And at an MSRP of $49.99, it is a great value. 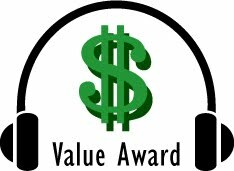 Based on it's quality, features, and performance, it has earned our Value Award. For more info and complete specs, check out their website of http://www.sansa.com/. Music is everywhere, and we like to take it everywhere with us. Portable MP3 players let us do that. And with the large storage sized of many of these players, it is easy to throw ALL of our music collection on them. So naturally, it is convenient to want to plug it into a device that will let us listen to our tunes at home, or at work. Enter the iPod dock. These small portable systems that are great for the bedroom, kitchen, or the office for example. They come in various sizes and levels in quality and price. The Kicker iK501 iPhone/iPod Dock is one such device. The Kicker iK501 iPhone/iPod Dock arrived double boxed, and it's box had attractive printed packaging. Opening the box was more protective styrofoam, as well as some accessories. Included were the user's manual, remote control, power cord, multiple sized iPod adapters, and an axillary cable for hooking up an MP3 player or other external device. Upon inspecting the iK501, I saw the quality of product I have come to expect from Kicker. It was well put together with a good quality fit and finish. I used the auxiliary input for external devices for more flexibility. It even has an audio and video output. So if you have video on your iPod, you can export it to a TV. It looked to have some great features, about the only thing I was slightly disappointed in is the lack of radio tuner. I was really excited at the speaker design which showed great promise! The Kicker iK501 has separate 3/4" tweeters, 5" midrange drives and a 6" square passive radiator subwoofer for additional low end extension. I had high hopes for the sound it would provide. Controlling the device was very simple. There was a blue LCD display that showed the volume, and switching between iPod and auxiliary input. A simple rotary knob is all that is needed to control the device. I also liked the ability to adjust the treble and bass. A build-in handle also made it easy to carry. I also can't forget the included remote control. Navigating thru albums and songs using the touch pad on my iPod Classic can be a pain when it is docked. But the remote makes it easy to do all the necessary navigating. No need to even touch the iPod while it is docked! I was not disappointed when it came to the sound and performance of the device. I first started with the axillary in, and connected a portable CD player. WOW! It sounded great, and worked great. I pulled out my iPod and connected it. I immediately saw that it had started to charge my iPod. Now that it is time to really rest the sound, I thought I would first start with some Steve Miller Band: Swingtown. It had nice tight kick drum beats, and the bass guitar had good extension. Vocals were natural and quite smooth sounding. The cymbals were also sufficiently crisp. Next I wanted to test some real bass with the passive radiator subwoofer. Justin Timberlake: Sexyback did just that. And WOW! The guys at Kicker did a great job designing the iK501! They must have gotten the airspace inside just right, because the passive radiator sure did not sound passive. Bass beats were clean, with a lot of authority. I could actually feel the vibration in my desk and in the floor under my feet! This thing rocks!! And just incase you aren't really into rockin' out, I then turned to Mannheim Steamroller's Fresh Aire V: Earthrise/Return. I liked the smooth strings, crisp percussion, and overall nice harmonics. There was good resolution in all the instruments. And what surprised me was the soundstage! The iK501 actually provided a nice deep soundstage with good imaging as well. I must admit that I was pleasantly surprised with the performance of the Kicker iK501. With so many choices of iPod docks, you never know how the device will perform or how good it will sound. With a brand like Kicker, you know they put out products that meet the expectations of their brand. The Kicker iK501 iPhone/Ipod Dock performed well and sounded amazing for an iPod dock. It doesn't get much better then the iK501. Infact, with how good it sounded, I know a few people who would be happy to use it as their primary stereo system! It really did sound good. At an MSRP of $269.95, there are cheaper options out there, but you do get what you pay for. And it performed well for its price point. 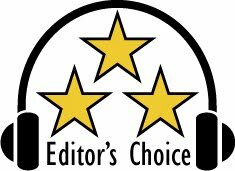 Based on it's design, features and performance, it has earned our Editor's choice Award, even without the radio tuner. For more info and specs, check out their website at http://www.kicker.com/. Thanks to Rock Band, there are many more self-proclaimed rock stars around the world. But when it comes to playing rock band, you also need to have the right tools. This includes the microphone, guitars, and drums. Up for review today is the ION Drum Rocker Premium Drum Set. Have you ever seen a drummer on stage performing? I'm sure most of us have. They abuse those drums. And of course, being rock stars, we would have to do the same. But to the dismay of kids, parents, and rockers around the world, not all drum sets are created equal. My kids enjoyed a drum set purchased from a local Best Buy store. But sadly, it could not handle being played like a rock star. The box was packaged well, with a nice picture of the drum set on the box. Unpacking and putting the drum set together, I was pleased with the apparent quality. It is not professional musician stage gear quality, but it is solidly built. The main pole pieces are aluminum, and the screw down connectors are thick plastic that appeared very durable. The included instructions showed step-by-step how to put it all together and was easy to follow. And once it was all put together, it looked like a drum set that could take a lot of abuse from my rock stars. The pads, cymbals, and controllers are also all well built. Even the cables that go from the controller to the drum pads and cymbals are nice thick cables unlike the thin 24-gauge wire of my old set. It's performance did not disappoint. Playing the set was easy. And with the build quality I was not worried about hitting them too hard and breaking them. The drum pads and cymbals were sensitive while not being overly sensitive and the cymbals performed just as well. And the drum pedal felt like a real drum pedal. When it comes to designing a durable, well performing, perfect drum set for Rock Band, ION nailed it with their Premium Drum Set. This is the drum set every young budding rock star needs. And to make things even better, if you think you have a drummer in the making, ION has you covered there too. The Premium Drum Set is usable with their optional module, which turns the drum set into a stand alone drum set. The ION Drum Rocker Premium Drum Set really was a delight to use. And the quality was great! Based on it's design, quality, and performance, it has earned our Editor's Choice Award. If you want your rock star to be really happy this Christmas, I'm sure the ION Drum Rocker Premium Drum Set will help. For more info and specks, check out their website at www.ionaudio.com. Not all speakers are created equal. Speakers first job is to produce good sound. Looks are also important. Up for review is a surround system from RBH. When it comes to speaker design, you will soon see they have all the bases covered. I was very impressed with the quality. The speakers came well protected. Opening the boxes showed a custom foam cut out to protect the speakers. The speakers were further protected by being covered in soft cloth bags. The impression I got was that these speakers were made with a lot of care and pride. The system retails for $4,200. The SX-61 is $1,200/pr, SX-661C is $900 each, and the SX-10 is also $900 each. Taking the speakers out of the cloth bags revealed that my first impressions were correct. The quality of the speakers were very good and very high. The cabinets were very solid, in a black oak veneer. And the craftsmanship of the cabinets was excellent! There was no sign of it being a veneer, as the cabinets had a look of being constructed using solid oak. The quality did not stop at the cabinets. The bookshelf and center channel include 6.5" midrange drive and 1" tweeter. Both of which are well put together. The 6.5" midrange driver has an aluminum cone, and rubber surround. The 1"tweeter is a silk soft dome design. The back of the cabinets reveal two sets of banana clip connectors. This means the speakers are also capable of bi-wiring. The included black cloth speaker covers are also simple but sufficient. They were also ported at the rear. The subwoofer also had the same quality in the cabinet. The 10" aluminum cone driver also had rubber surround, and appeared well built. The driver was front firing, with a black cloth grill. The cabinet was ported with a single port on the bottom. The built in amp on the back of the subwoofer had the features and controls commonly found on subwoofers: volume crossover, phase. It also had the line input,and a set of line outputs. Another typical feature was the auto on function, that would turn on when it sensed a signal. But to go along with the RBH quality, it also had a feature not as common, a balanced line input and output. So far I'm impressed with RBH. They make a high quality speaker system, as far as build quality and components used. They are well put together. And the cabinets are gorgeous. They would look great in any decor. But speakers can't just look good. The next question is how good do they sound? I thought the listening test should start with the big screen. And I first turned to Star Wars Episode One on blu-ray. It was engrossing. The DTS-HD soundtrack was stellar on the RBH's. I kept getting engulfed in the movie, and had to remind myself to pay attention to the soundtrack. But I guess that is a sign of a good speaker system. The vocals came through loud and clear from the center channel. And of course using the same drivers, timbre was well matched and gave a smooth flowing sound from left to right and right to left as space ships flew across the screen, as well as front to back and back to front. Next was one of my favorite demo tracks, from the Fifth Element, where the Diva sings. The RBH system threw a nice big soundstage. And the dynamics for a two-way system were very good. And the harmonics from the Diva singing were amazing, with great detail and resolution. There was also no audible resonance from the cabinet, which I'm sure was partly due at least to the curved design of the cabinets. I was equally impressed with the subwoofer's performance, for a single 10" driver in a fairly small enclosure. The fighting scenes and explosions on the cruise ship were natural, and gave a good sense of realism. For a 10" driver, it had good low end extension, and played with sufficient amount of authority. And to really put the subwoofer to the test, the Star Wars Episode One movie is known to have bass down to under 20Hz. One of my favorite is the pod race scene. The subwoofer preformed well with the low end extension of the various pod engines as they speed through the desert terrain. Again, the subwoofer played with authority, filling my demo room with bass, and only on one occassion sounded slightly strained and possible bottoming out due to the demanding material at high volume. Again, for a single 10 inch driver with this material, I was impressed. For music I turned to Fresh Aire V: Going to Another Place. The strings were crisp without being bright. The flute had some good air to it, with good pitch definition. I loved the excellent harmonics. The midbass in the drums had excellent punch and resolution. They also threw a nice sized soundstage that was fairly deep. The next track I chose was Junior Wells: Why are People Like That. The male vocals were very natural sounding. Imaging was also spot on as the vocals appeared to come from my center channel speaker, even though I was only listening in stereo. The large string bass was clean with good low end extension and output, helped with the ported design. The harmonica was smooth, yet a tad raw with very good dynamics, as the artist intended. And since it is for the holiday Gadget Gift Guide, I thought I would include one Christmas song with Pat a Pan, from Mannheim Steamroller. The percussion was really crisp and clean, and the flute again had a lot of air. Resolution in the violin and snare drum was excellent. Imaging was also precise. Listening in stereo, as the drums panned from right to left, you could hear the drums exactly from right to slightly left of the right speaker, to where the center channel speaker is, to just to the right of the left speaker, and finally end at the left speaker. I loved it! When compared to some of my reference systems- NHT Classic 3 with SVS PC+ 16-46 subwoofer, and Thiel SCS4, they held their own extremely well. The NHT Classic 3 is a 3-way bookshelf speaker in a sealed design. The 3-way design gave the NHT's slightly better dynamics for movies. But the RBH edged the NHT's in resolution, bass extension, and were overall slightly more musically transparent. The Thiels are at a much higher price point and as such performed better on all fronts. But not overly so. At their price point, the RBH system performed well. The RBH subwoofer also performed well compared to the SVS PC+ 16-46. The SVS is significantly larger with a larger 12" driver. This allowed the SVS subwoofer play extremely deep, to under 16Hz. And it did so with great authority. and while the RBH SX-10 did not play as deep, or with as much authority, it did perform well. It filled my room with lots of bass, and played down to 25 Hz. For the size of it's enclosure, and it's performance, it earned my applause. I have heard great things about RBH. When I first unboxed the SX system and saw their quality, I had high expectations. I'm glad to report that I was not disappointed. And I doubt you would be too. It is a great versatile system that performs well for music and movies. And the Signature SX system has only whet my appetite. I can only imagine how good their reference system would sound. Based on their design, features quality and performance, they have earned our Editor's Choice Award. Congrats! for more info and complete specs, check out their website at http://www.rbhsound.com/.